From nextSTL: The Independence Center is proposing a mixed use project for the northwest corner of Sarah Street and Laclede Avenue. They propose 38 apartments on two levels above 15,000 square feet of clinic and retail space. Independence Center would like to place a 12,000 s.f. clinic and a 3,000 s.f. floral shop on the first floor. The project would replace a vacant corner lot. Bond Architects of Clayton is the designer. If the project is allowed to move forward, PARIC would be the general contractor. The 45,000 square foot building is expected to cost between 10 and 11 million dollars. The Independence Center already owns the apartment building immediately to the west of the site (at left in image above). The Independence Center provides housing, support and services for men and women with mental illness. 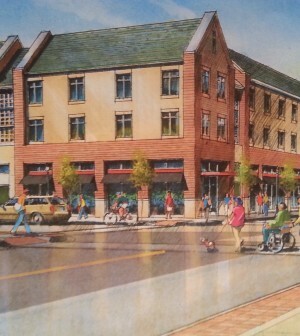 To move forward, the project may require three zoning variances. First, a project of this magnitude has a zoning requirement of approximately 70 parking spaces, and the Independence Center is proposing only 25 spaces off the alley, plus another 15 surplus spaces from their building next door. Given that few Independence Center residents drive, there is likely to be only minor objection to such a variance. The proposal in its current form would require two other variances, however. One exception would be required for the use of stucco on the upper levels–a material not allowed under the neighborhood’s Form Based Code. Another variance would be required to allow a clinic facing Sarah. Doctors’ offices are not considered retail under current zoning laws. Read more.